This is the month where we can enjoy the births of macaws. On the warmer days of this summer season, we could see the chicks of the Blue-headed macaws (Primolius couloni), Blue-throated macaws (Ara glaucogularis) and Red-fronted macaws (Ara rubrogenys) hatching out of their shells. All these species native to the heart of South America have first seen the light of day during these propitious months for pairs of these parrots that have attained sufficient maturity to complete the cycle of life. Similarly, the timid cheeping of nestlings of Scarlet macaws (Ara macao), Blue-and-yellow macaws (Ara ararauna), Military macaws (Ara militaris) and Great green macaws (Ara ambiguus) can be heard, whose parents spread their wings out in order to defend their territory. We are always amazed at how the parents manage with their large beaks to feed very carefully these delicate creatures. However, with the most rigorous feeding schedule, they manage to fill the crops and energetically protect them from sunrise to sunset. Undoubtly, the highlight of August has been the birth of a Yellow-tailed black cockatoo (Zanda funerea xanthonota) which is native to Tasmania. This was quite an event, because after many futile attempts, they finally arrived at a successful fertilization. The preparation for breeding of such specimens depends directly on the food intake of small and fine seeds. Despite its large beak and body, they are very light animals: authentic comets flying high up in the sky of Australia. 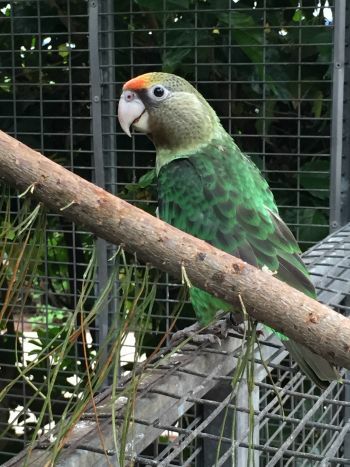 This bird has been bred for the first time in Loro Parque and Europe. The breeding of the black cockatoos outside Australia is a major challenge. 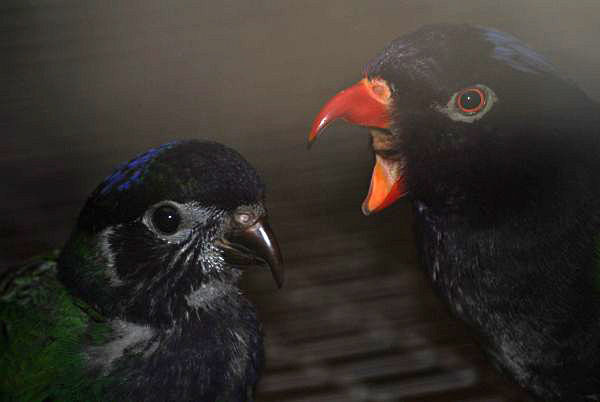 The specific needs of these birds mean that very few breeders achieve success. The eggs are often laid outside the nest and are sometimes damaged by the sharp claws of the restless mother. Therefore, it is important to prepare and offer several nesting sites in order for them to select a secure nesting place. Another option is to collect the eggs from outside the nest or unsuitable places due to the anxiety of the timid females, which do not withstand much disturbance. 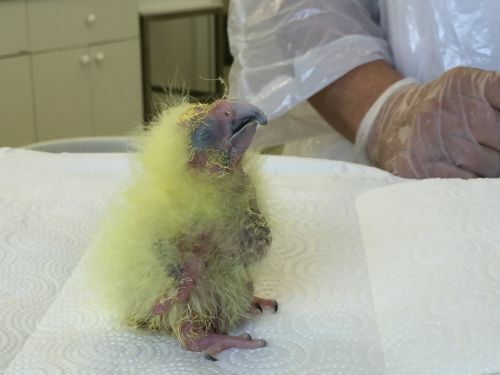 The use of advanced food mixtures from Versele Laga, and with the reliable technology of the Inca incubator 200, coupled with the experience of the Loro Parque Fundación technical staff has resulted in the successful birth of this chick. The yellow plumage of these nestlings is so fascinating that you can hardly look away, and soon the first black feathers will start to grow, showing a beautiful contrast. Other nestlings are emerging from their nests under the watchful eye and care of their parents. In the breeding centre of the Loro Parque Fundación, a young Cape Parrot (Poicephalus robustus) is learning how to fly, accompanied by its mother, which was flying around all the time. It will soon know every corner of its environment and start to eat independently. In the same way, a chick of the Burrowing Parrot (Cyanoliseus patagonus bloxami) fledged from its nest in a large aviary where the species breeds in a colony. This young dark bird will remain for the first days on the floor of the enclosure, where it can be easily confused with the substrate, but will be protected by its group. To prevent any danger to the nestling, such as predators, the parents fly down to it, followed by the rest of the group in order to distract predators and confuse them as to which bird to attack. This behaviour is rare in other parrot species that as single pairs raise their nestlings. The gregarious behaviour of this species reveals a lot about its survival strategy. 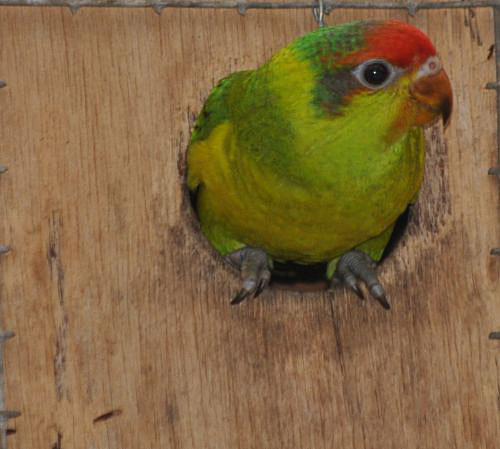 The Papuan lorikeets (Charmosyna papou goliathina) also raise their nestlings alone. Many of the young begin to explore the surroundings on their own, and they will soon be flying together with others of their species, in both plumage colour phases. Summer is not only the breeding and fledging period for many species, but is also a resting and moulting period for others. We use this time to change the contents of the aviaries and to prune the plants outside them. This will allow a vigorous regrowth of the plants, a new design of the environment and more light for the parrots. It is an important process for the parrots, as they need the seasonal change. And lastly, as a final flourish of this month, we were able to observe a chick of the endangered Iris lorikeet (Psitteuteles iris) flying from its nest. Loro Parque Fundación has managed to breed this species in captivity for the first time.